Ion exchange resins are polymers that act as ion exchange mediums. They are insoluble in water, cross-linked, and chemically inert. Ion exchange resins are functionalized polymer microbeads, which are usually yellow or white in color. They consist of a fine network with numerous cavities/micropores. The polymer base of resins is manipulated in order to exchange components with surrounding solutions. Ion exchange resins are mostly used for water and wastewater treatment in various end-user industries. A substantial amount of ion exchange resins are used in chemical companies at various process stages. These resins are also used in sludge treatment plants. Recently, the chemical industry has been experiencing instability, due to high fluctuations in the dollar value. This is hampering exports. Economic slowdown in countries such as China and Japan is also adversely affecting the industry. The water & wastewater treatment industry has immense growth potential. Moreover, only 60% of the industrial wastewater is treated, while approximately 40% of the treated water does not conform to the prescribed standards. In case of sewage treatment, the situation is more serious, as, globally, the urban area has capacity to treat just 37% of the sewage generated. North America leads the global ion exchange resins market, followed by Asia Pacific. Asia Pacific is expected to offer relatively higher growth potential to the ion exchange resins market compared to North America in the near future. This can be ascribed to growth of end-user industries such as water treatment, power generation, and mining. Around 33% of the global population faces moderate or severe water stress. The quality of underground water resources is diminishing. Thus, a global deficit for clean water is anticipated in the next decade. Furthermore, statistics suggest that around 4.5 billion people are projected to need to utilize polluted water resources by the end of the forecast period. The demand for industrial water goes hand in hand with the rate of industrialization. Rapid industrialization, especially in Asia, goes analogous with the rising demand for industrial water. Increase in water pollution in some of the major regions such as Asia is driving the need for water treatment technologies. The energy sector witnesses significant demand for water treatment. Ion exchange resins such as weak acid cation resins, strong acid cation resins, weak base anion resins, strong base anion resins, chelating resins, and mixed bed resins are used for municipal and industrial water treatment. Thus, increase in the demand for the treatment of municipal/industrial water and wastewater is anticipated to drive the global ion exchange resins market during the forecast period. Ion exchange resins do not remove microorganisms such as bacteria from the feed water; however, they sometimes aid in bacterial growth. Organic matter may accumulate on resin beds, which serves as a source of nutrients for bacteria. If sterile water is required after the treatment, the demineralized water produced by the ion exchange treatment plant needs to be treated by heat, ultraviolet irradiation, or very fine filtration. Ion exchange resins beds can also be treated with disinfectants such as formaldehyde, but not with heat or chlorine, as these are likely to damage the resin. These factors are anticipated to restrain the ion exchange resins market during the forecast period. The biodiesel industry has been looking for ways to replace the traditional conversion methods. Purolite has announced a deal with Transbiodiesel, a technology startup, to manufacture and market enzyme-loaded ion exchange resins meant to replace sodium methylate and provide simultaneous esterification of free fatty acids and trans-esterification of fats and oils. The system improves conversion economics in several manners. Absence of emulsifying soaps makes it easy to separate the fuel from glycerin and low-grade oil feedstock with FFA content as high as 100%. Currently, chemical catalysts are employed in the production of biodiesel. These catalysts have substantial drawbacks in terms of environment and operations and a considerable impact on cost-effectiveness. Enzyme-loaded ion exchange resins can be utilized as enzyme-based catalysts and also, to eliminate the above-mentioned drawbacks. In November 2017, the Dow Chemical Company launched next-generation ion exchange resins, which were re-engineered specifically to attain efficient industrial water treatment. In July 2017, Mitsubishi Chemical Corporation started selling river water treatment systems to public and private sectors in Myanmar, where the economic growth is anticipated to drive the demand for safe drinking water. In May 2017, ACM Technologies, a ResinTech company, opened a new facility for generation of ion exchange resins in Gardena, California (the U.S.). The plant is likely to process spent resins, by providing regeneration and subsequent reuse. Innovations and capacity expansion is an indication of steady growth of the market for ion exchange resins. Among products, mixed bed resins has been a dominant segment for the last few years and the same trend is likely to continue during the forecast period. Mixed bed resins are generally used in power generation, water treatment, and nuclear applications. High-quality water is essential to meet the needs of heavy as well as light industries for various industrial processes. Industrial processes such as heating, cooling, and rinsing require a large amount of processed water. Ion exchange resins are utilized in order to obtain high-quality industrial water. Among applications, the industrial water treatment segment held a major share of the ion exchange resins market in 2017 and is anticipated to continue its dominance during the forecast period. Regions such as Asia Pacific, especially developing countries such as China, India, Vietnam, and Indonesia, are experiencing major economic and infrastructural development. This can be attributed to rapid industrialization in the region. Thus, the market for ion exchange resins in Asia Pacific is anticipated to expand at a rapid growth rate during the forecast period. On the other hand, North America accounted for a major share of the global ion exchange resins market in 2017, followed by Asia Pacific. North America is anticipated to continue its dominance during the forecast period as well. The global ion exchange resins market is consolidated, as top four manufacturers accounted for more than 40% of the market share in 2017. Key players operating in the market include Lanxess AG, The Dow Chemical Company, Purolite, and Mitsubishi Chemical Corporation. Increase in the demand for municipal and industrial water treatment is one of the driving factors for the global ion exchange resins market. Also, increase in the demand for ion exchange resins in food processing applications for eliminating contaminants is among the important factors responsible for growth of the ion exchange resins market. Industrial and municipal water treatment are major end-use applications of ion exchange resins. This is largely due to rapid industrialization, especially in regions such as Asia Pacific, which leads to the rising demand for industrial water. Increase in water pollution in some of the major regions such as Asia Pacific is driving the need for water treatment technologies. This report analyzes and forecasts the market for ion exchange resins at global and regional levels. The market has been forecast in terms of volume (m³) and revenue (US$ Mn) for the period from 2018 to 2026, considering 2017 as the base year. The study includes drivers and restraints for the global ion exchange resins market. It also covers impact of these drivers and restraints on the demand for ion exchange resins during the forecast period. The report also highlights growth opportunities for the ion exchange resins market at global and regional levels. The report includes detailed value chain analysis, which provides a comprehensive view of the global ion exchange resins market. Porter’s five forces model for the ion exchange resins market has also been included to help understand the competition landscape of the market. The study encompasses market attractiveness analysis, wherein products and applications are benchmarked based on their market size, growth rate, and general attractiveness. 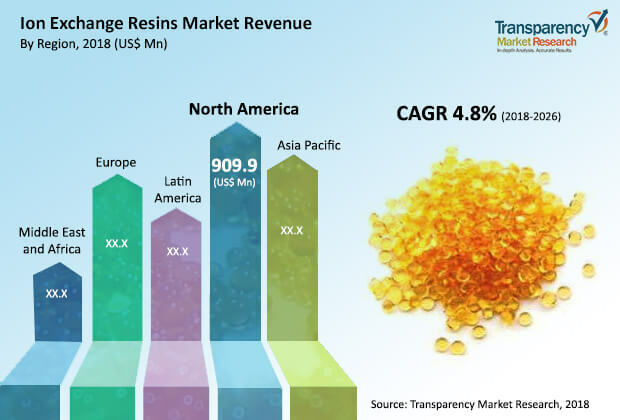 The study provides a decisive view of the global ion exchange resins market by segmenting it in terms of product, application, and end-user industry. In terms of product, the ion exchange resins market has been classified into adsorbent resins, chelating resins, strong acid cation resins, weak acid cation resins, strong base anion resins, weak base anion resins, and mixed bed resins. Based on application, the market has been divided into sugar refining, liquid glucose, uranium mining, gold mining, TAME, Bisphenol A, industrial water treatment, food & beverages, ultrapure water, MTBE catalysis, pharmaceutical, municipal water treatment, water softening, and others. In terms of end-user industry, the market has been segmented into pharmaceutical, industrial water treatment, municipal water treatment, mining, electrical & electronics, power generation, nuclear power, food & beverages, chemical production, and others. These segments have been analyzed based on present and future trends. Regional segmentation includes current and forecast demand for ion exchange resins in North America, Europe, Asia Pacific, Latin America, and Middle East & Africa. The report provides the actual market size of the ion exchange resins market for 2017 and estimated market size for 2018 with forecast for the next eight years. The global market for ion exchange resins has been provided in terms volume and revenue. The market volume has been given in m³, while the revenue has been given in US$ Mn. Market numbers have been estimated based on product, application, and end-user industry. Market volume and size have been provided for global, regional, and country-level markets. The report comprises profiles of major companies operating in the global ion exchange resins market. Some of the key players operating in the market are The Dow Chemical Company, Ionic Systems Ltd, Purolite, ResinTech Inc., Lanxess AG, Thermax Limited, Mitsubishi Chemical Corporation, Ion Exchange (India) Limited, Novasep, Evoqua Water Technologies LLC, Finex Oy, and Eichrom Technologies, LLC. Market players have been profiled based on attributes such as company overview, financial overview, business strategies, and recent developments.